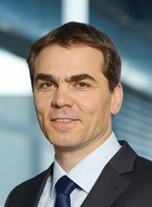 Uwe Wagner studied Mechanical Engineering at the University of Stuttgart. In 1993 he started at LuK in Torque Converter Development department as development engineer for hydraulic control unit and SW development. From 1995 to 2007 Mr. Wagner held the manager positions in the following departments: in Torque Converter Development, CVT Chain Development and Production and Productline Automated Gearbox and Double Clutches. In 2007 Uwe Wagner took the position of President in Business Unit Transmission Technologies and in 2014 he was appointed Senior Vice President R&D Automotive, Member of the Management Board Automotive. Since September 2016 Mr. Wagner holds the position of Senior Vice President R&D Automotive and Industrial, Member of the Management Board Automotive and Industrial. Schaeffler develops and manufactures precision products for everything that moves – in machines, equipment, and vehicles as well as in aviation and aerospace applications – with its brands INA, LuK, and FAG. Schaeffler is a leading manufacturer of bearings worldwide and a renowned supplier to the automotive industry. The globally active group of companies, which is based in Herzogenaurach, Germany, generated sales of approximately 11.1 billion EUR in 2012. With over 76,000 employees worldwide. With 180 locations in over 50 countries, Schaeffler has a worldwide network of manufacturing locations, research and development facilities, sales companies, engineering offices, and training centers. Customer proximity is important for the development of market-specific products, and for short delivery times and rapid service. All Schaeffler plants worldwide work to the highest standards of quality and environmental protection and are certified to internationally-applicable standards. Moreover, with its Code of Conduct, Schaeffler has committed itself to compliance with high social and ethical standards. Our main customer is the automotive industry, with around 60 percent of our sales. Schaeffler is a recognized development partner for the automotive industry with systems expertise for the entire drive train – this includes the engine, transmission, chassis, and accessory units in passenger cars and heavy trucks. 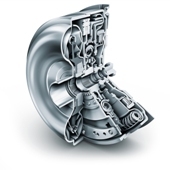 Schaeffler offers a wide range of products that includes everything from energy-efficient solutions for conventional drive trains with internal combustion engines and products for hybrid vehicles up to components for all-electric vehicles. High-precision products from INA, LuK, and FAG contribute to lower energy consumption and emissions in vehicles without sacrificing driving comfort, safety, and enjoyment. Our customers include all renowned automotive manufacturers and well-known suppliers worldwide. Schaeffler Automotive Aftermarket supplies distributors and independent workshops with replacement parts in OE quality for all vehicle classes and a comprehensive range of services worldwide. It also promotes qualification and specialist knowledge about its brands and products, and provides support with marketing. Besides global customer proximity, active employee development, and sustainable management, the most important factors in Schaeffler’s success include innovation and creativity. Approximately 6,000 employees at 17 R&D centers, develop new products, technologies, processes, and methods for solutions that are tailored to the market. Schaeffler is among the innovation leaders in industry with more than 1,850 patent registrations annually, and currently over 18,500 effective patents. Our main development locations on Germany are Herzogenaurach, Schweinfurt, and Bühl, which are linked with numerous further development centers in Europe, Asia and both North and South America. 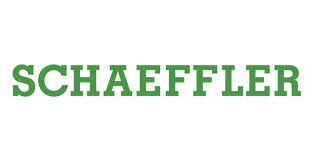 Schaeffler distinguishes itself through foresight and by thinking and acting in the long term. Schaeffler thus identifies key trends at an early stage, invests in the research and development of new, future-oriented products, defines new technology standards, and makes them ready for volume production. Schaeffler offers a wide range of innovative products such as rolling bearings with optimized performance and friction behavior, electromechanical components, rolling bearings with integrated functions, and direct drives, which increase efficiency and help reduce CO2 emissions in applications such as renewable energies, mechatronics, and electric mobility. The numerous activities relating to electric mobility are bundled together in the “eMobility Systems Division”. 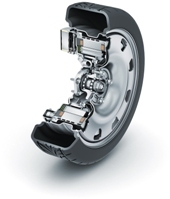 The wide-ranging product portfolio already offers numerous solutions: The range extends from start-stop solutions, and hybrid clutches right up to electric drives. 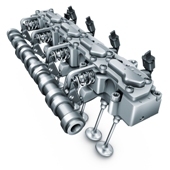 Almost every modern passenger car today contains INA engine and transmission components. Variable cam timers and hydraulic bucket tappets ensure improved performance, reduced fuel consumption, lower emissions and increased driving comfort in modern car engines. The high quality and reliability of INA rolling bearings, engine components and linear technology have made Schaeffler a recognized and reliable partner to numerous customers in the industrial sector all over the world. The FAG brand is inextricably linked with the rolling bearing industry. Whether it is high-precision bearings for aerospace applications, sensor wheel bearings for passenger cars, or large bearings with outside diameters of over four meters for wind turbines, FAG is the number one choice for all customers in the aviation and aerospace, industrial, and automotive sectors. FAG's range of products and services complements INA's in an ideal way. Within the Schaeffler Group, the LuK brand focuses exclusively on the automobile industry. The LuK Group has been part of the Schaeffler Group since 1999. Several pioneering products such as the self-adjusting clutch, the dual mass flywheel, and the dry double clutch followed. Innovative force and technological leadership are the mainstays of the company. Today, one in four cars worldwide has a LuK clutch. In conjunction with customers, LuK is intensifying its activities in finding solutions for the automobile world of tomorrow, for example, with the double-clutch transmission or components for continuously variable transmissions for more safety, comfort and fewer emissions.